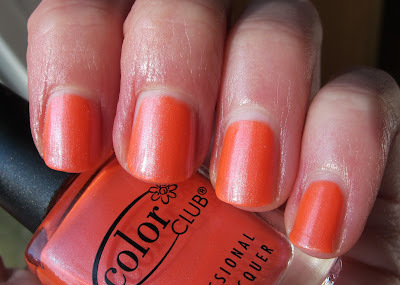 Never Enough Nails: Color Club Makes Me (Tangerine) Scream!! Today's post contains the bright and shimmery Color Club Tangerine Scream that I mentioned when I posted Color Club Volt of Light last week. Tangerine Scream is also from the Electro Candy collection. 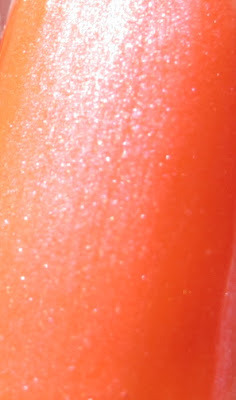 It's a bright neon orange with blue/green shimmer. I think the blue/green tint of the shimmer is a bit more obvious in the bottle, but you can see it at certain angles on the nail. It adds a cool look to the polish, almost duochrome-y, but not quite. I really love this polish! 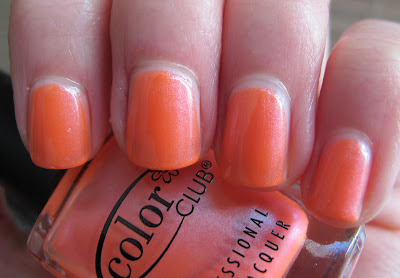 I love neon orange for summer and the shimmer in this one makes it apply nicely and dry streak-free. It appears in some of these photos that I got some bubbles in one nail, but I was sitting directly under a fan (it's hot out!). Definitely not the fault of this lovely polish! By the way, I couldn't see those bubbles in real life, damn macro setting! As this is a neon polish, it dries a bit matte, but that is easily fixed with a top coat. It also has a bit of VNL (this is three coats), but I do find that to be pretty common with neons. It is quite a bit more opaque than Volt of Light. The shimmer in Tangerine Scream also makes it a more flattering color than a stark neon orange creme, in my opinion. The Electro Candy collection is still readily available online (at Victoria's Nail Supply), so if you missed it when it came out, definitely check it out now! 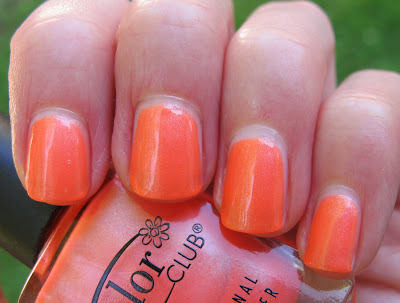 Tangerine Scream is a super bright polish that is perfect for fingers and toes in the summer! By the way, I see that my poll about creating a new make-up blog/posting here is actually very close now. I still haven't completely decided what to do, but I do appreciate your feedback. For those of you who voted, would you tell me in the comments why you voted the way you did? Thank you! I was never into orange polish before this year but now I love it! This is a great color! I have a few from this collection but not this one so now I think I need to go get it!